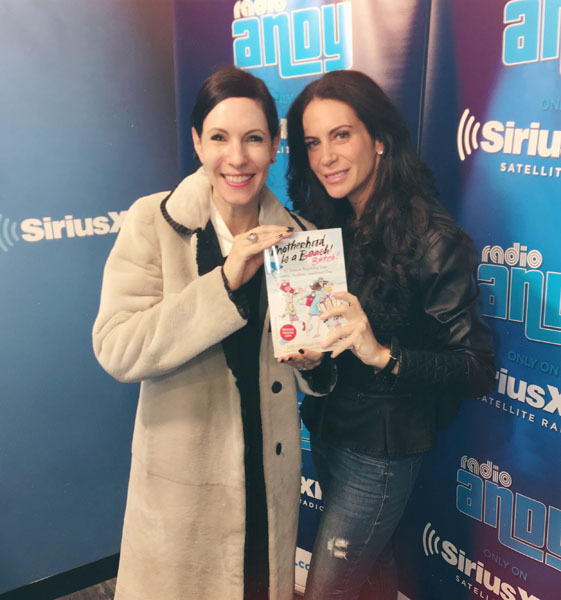 Jill Kargman, who writes and stars in the hit TV show Odd Mom Out, was delighted to write the forward for her friend Lyss Stern’s new book, “Motherhood Is A B#TCH: 10 Steps to Regaining Your Sanity, Sexiness, and Inner Diva,” out April 18. “It was so heartfelt and real about how she felt as a mom, as a first time mom and how she reclaimed herself back,” Stern says, clearly touched. The message behind the book, says Stern, is that once you become a mom, you don’t have to lose sight of who you are. “For me and for so many other moms out there, between working and taking care of the kids, and whether or not you’re a stay at home mom, so much of it becomes about the kids. And you forget about you as the woman and you forget about you as the wife.” It’s about reclaiming your life. Stern knows from giving moms advice. Thirteen years ago she founded Divalysscious Moms, a networking company specifically for moms, with cool, chic, kid-friendly activities like a grand opening of the Fendi Kids boutique on Fifth Avenue. There is usually swag in the form of gift bags, but most important, you get to have fun, and to meet other moms. New mothers, especially, often feel isolated; Stern was there herself, and that’s how she came up with the idea. When her first son, Jackson, was born, Stern went to a new mother’s luncheon on the Upper East Side, and attendees couldn’t talk to one another or socialize, and the woman running it said, “Today we’re going to teach you how to breastfeed,” and a light bulb went off in her head. “This is where you went to ‘meet’ new moms,” says Stern, now a mother of three, “but yet you weren’t allowed to talk to the new moms, the babies weren’t allowed to cry, and I was horrified by what I found.” She had an epiphany; her call to action would be to help other moms. She just had to figure out how. At that time, there were only a handful of Mommy blogs, so she was something of a pioneer. But ever since she was a girl, Stern has always been ahead of trends. DivaMoms launched E.L. James’s “Fifty Shades of Grey” book before anyone had heard of it. The events started as a grassroots movement, and her mom friends told their friends, and today, Divalysscious Moms reaches over one million moms directly. They call it an offline community, because they hold events all around New York City and in the Hamptons. “Companies hire us to bring the moms in, because they’re tastemakers, they’re influencers, sometimes before it even officially opens to the public,” Stern explains. Her entrepreneurial endeavors include giving back; for ten years, she has run the children’s area at Super Saturday, the annual Hamptons ovarian cancer research fundraiser. It’s called Camp Divalysscious and features face painting, magic shows and more, plus activities for parents as well. Stern is also working with her husband to create a comedy television show called #NanaDoll about her widowed mother, who she says is a real character.